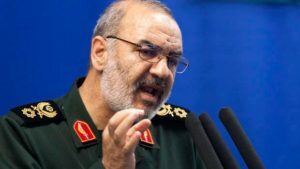 An arsenal of some 100,000 missiles is based in Lebanon ready to strike Israel, the deputy commander of the Iranian Revolutionary Guard Corps (IRGC) said. “The opportunity to destroy Israel is now better than ever, because tens of thousands of long-range missiles all over the Islamic world are ready to hit Israel immediately upon receiving the order,” Brig. Gen. Hossein Salami said in an address on June 30 during Quds Day, Iran’s annual commemoration of the country’s solidarity with the Palestinian people. Tens of thousands of Iranians took to the streets in Teheran and in 850 other cities in the Islamic Republic on June 30 to mark the annual Quds Day, raising banners with anti-Israeli and anti-American slogans.